xxero is a collaborative, text-based environment and a platform for real life meetings. Since program code and text is the only way to create, language is the inevitable element of navigation and construction. What gets written, gets done at the same time! By presenting xxero with its virtual minds we want to encourage TICT (Traditional Interactive Communication Technology) as a useful practice to dive deeper into the system behind. For the virtual minds exhibition and congress at Bremen we decided to focus on the hybrid idea of the congress with every participant being defined as a virtual mind — congress speakers and bots being approached on the same level. We installed a shop display at the former Rossmann store where every visitor could buy a package containing a sport prop alike starting number with all information needed to access xxero from within the exhibition or from home. As the shop situation — besides the expectable art audience — attracted many regular shoppers, especially on shopping Saturdays, the xxero-shop sold “TICT identity starting numbers” to all sort of different accidentally participating people. The package contained only the basic information necessary to find xxero, to log in and to slip into the predefined xxero identity which corresponded to the number printed on the starting number3. The participants were asked to wear their numbers while staying in the virtual minds context. 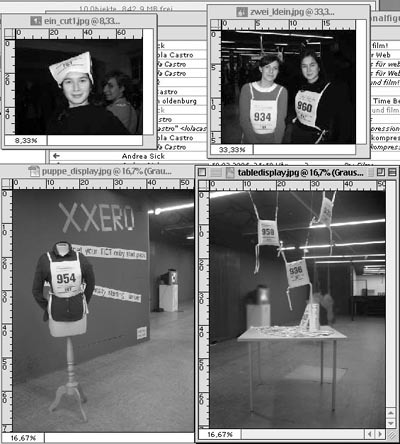 After entering the XXERO-MOO they found more hints and tasks on how to use it when participating in the real life of the town.Like this a set of simple anchors was defined for the participants meeting in virtual as well as in real life xxero context. They formed the rule set for a network of communicational modules4 evolving in a playful way and getting more and more complex the more the participants switched between virtual and real life contacts.